Cincinnati Music Hall, designed by architect Samuel Hannaford, is one of the most architecturally acclaimed multi‐function performance venues in the world. Pittsburgh (Pa.)‐based architecture firm Perfido Weiskopf Wagstaff + Goettel(PWWG) recently served as lead architect for the restoration and renovation of the historic concert theater. Cincinnati Music Hall was built in 1878 in Over‐the‐Rhine, a neighborhood that has undergone significant revitalization over the past 10 years. The red brick, High Victorian Gothic structure features a large auditorium, ornate foyer, offices, carpentry shop, rehearsal rooms, dressing rooms, and a ballroom. Music Hall is owned by the City of Cincinnati and managed by the Cincinnati Arts Association (CAA), and is home to the city’s symphony orchestra, pops orchestra, opera, ballet, and the May Festival. 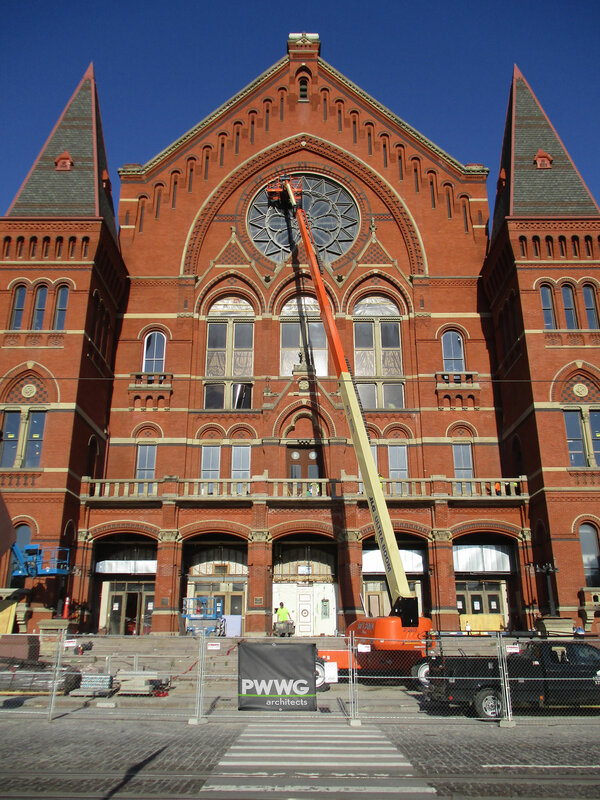 The $143 million revitalization for two clients working as partners — Cincinnati Music Hall Revitalization Corporation (MHRC) and Cincinnati Center City Development Corporation (3CDC)–is PWWG’s latest project in an expanding portfolio in downtown Cincinnati. Music Hall was named to the National Trust for Historic Preservation’s 2014 list of America’s 11 Most Endangered Historic Places, a list that spotlights the nation’s architectural, cultural and natural landmarks that are at risk of destruction or irreparable damage. Music Hall had not had a significant upgrade in more than 50 years and needed extensive structural, functional, and aesthetic upgrades inside and out. Systems in the 225,000-square-foot facility were operating on borrowed time, amenities were out of date, and many areas were not ADA accessible. In addition, this iconic home to Cincinnati’s renowned performing arts organizations had been surrounded by blight in the low‐income area of Over‐the‐Rhine. Cincinnati officials, the building’s tenants and patrons, and the residents of the surrounding low‐income neighborhood, have long recognized Music Hall’s potential to create jobs and provide cultural enrichment to the community. In 2014, the City of Cincinnati partnered with MHRC and 3CDC to initiate an ambitious, comprehensive rehabilitation of the structure, expand Music Hall’s programming capacity, and strengthen its ability to engage with the surrounding community. As the National Trust for Historic Preservation notes, being on the endangered list often rallies the community around places they love which are threatened. Funding for the comprehensive renovation of Music Hall came from a broad base of public and private sources, including a $10 million grant from the City of Cincinnati, plus a $6.6 million ongoing pledge; $5 million from the State of Ohio; $48 million in tax credit equity, including a $25 million catalytic award from the Ohio Historic Preservation Association; $53 million in private donations; and contributions from private citizens. To maintain the building’s Historic Register status, the stakeholders needed to engage the services of a firm with deep experience in restoring historic structures, capable of leading a team of experts in all facets of theater design. PWWG (Pittsburgh, Pa.) as lead architect. PWWG had previously managed the “Part 2” application process that secured a $25 million grant from the State of Ohio to kick-start project funding. Martinez+JohnsonArchitecture (Washington, D.C.) as theater design architect, focusing on restoration and design related to the venue’s main Springer Auditorium and new rehearsal space in the North Hall. Akustiks (South Norwalk, Conn.), acousticians who create performance spaces worldwide for orchestral, operatic, and theatrical companies. For Music Hall, they redesigned Springer Auditorium’s acoustic systems and a new forestage canopy. SchulerShook (Minneapolis. Minn.), theater consultants, had oversight on theatrical issues, lighting design, overall functionality, and major seating enhancements for Springer Auditorium to improve sightlines. 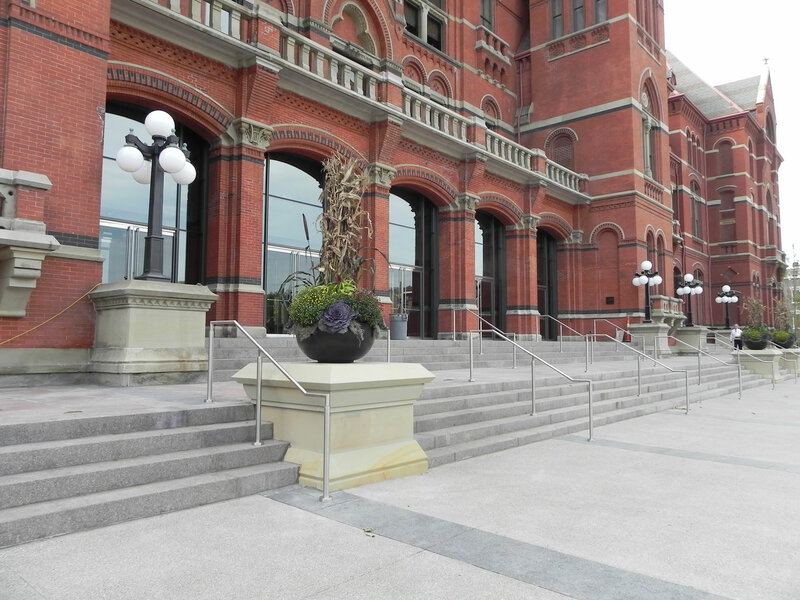 Pennoni(Philadelphia, Pa.) provided mechanical, plumbing, electrical, and fire and protection design services for the project, as well as a systems infrastructure plan to address noise, vibration controls and operating costs in the historic structure. THPLimited (Cincinnati) were structural engineers. MesserConstruction (Cincinnati) was construction manager. Restore the heritage of a world‐class facility for performers and audiences. Significantly enhance acoustics of Springer Auditorium and the overall audience experience. Improve accessibility and modernize the facilities to make them state‐of‐the‐art. Economize operation of back-of-house spaces. Execute lasting structural improvements required to secure the institution’s legacy for generations to come. All work had to meet exacting standards of the Ohio State Historic Preservation Office and National Park Service. The High Victorian Gothic design was originally punctuated with an extensive decorative pattern of black brick among the red brick façade. An unfortunate sandblasting in 1969 eliminated virtually all the black brick patterning. The current project included a “re-staining,” executed by coating each brick individually, based on historic photographs and telltale evidence of the locations of original black bricks. Restoration of limestone site work at the main entrance along Elm Street including: removing the switchback ramp added in the 1970s and relocating the accessible entrance to the South end of the building, at ground level, near amenities and vertical transportation; reconstruction of the elegant entry steps to align with the original design; new limestone plinths that enhance the historic fabric without copying it. Opening bricked-in windows and archways on the Central Parkway side of Music Hall to restore dramatic views in and out. Three arched semi-circular windows below the building’s memorable rose window now have lacey tracery recreated from historic photographs. Springer Auditorium, the building’s central performance space, has been strategically reconfigured and “right‐sized” to accommodate 2,200–2,500 patrons — down from 3,500 — with greater comfort (more legroom and seat width) and unobstructed views suited to contemporary audiences. The design also includes enhanced acoustics and more flexible staging for varied performances. A complete redesign of Cincinnati Symphony Orchestra’s offices in the South Hall to accommodate increased staff in the same footprint, make operations more efficient, and introduce natural light to a cavernous space. PWWG designed an open floor plan that co‐locates teams working on diverse operations like fundraising, graphic design, and finance in mini‐environments that support a variety of work needs from collaboration and learning to privacy and focus. The aesthetic is fresh, modern and bright, with acoustical amenities to create and maintain a productive aural environment. The Taft Suite, a new donor lounge, was designed in the former carriageway. The space features restored wood panels from Music Hall’s original massive organ from 1878, now a museum‐quality display. Also, the entire building is now fully ADA‐compliant for guests with disabilities. Construction was completed in October 2017, and the hall hosted a gala grand opening concert on October 6by the Cincinnati Symphony Orchestra. Music Hall had been closed since June 2016 to allow full access to all parts of the building during the extensive and complex renovation. To celebrate the opening, each of the six resident companies staged a debut in the month of October, tours were offered for the community, and Cincinnati public radio and public television aired specials and documentaries about the restoration of Music Hall. Notably, Music Hall is now listed on the National Trust’s list of “saved” structures. For more information about PWWG, visit www.pwwgarch.com.